Here is the male bluebird hunting from a higher point. Great shot - nicely focussed. Nice picture!! He looks pretty intense here!! I don't know Lori, I wondered the same thing ! I guess a look at the latin names would help answer that question......... maybe. 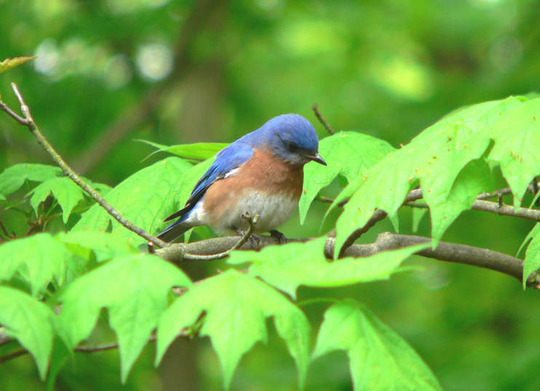 Eastern Bluebird is Sailia sailis. I'd have to Google the English robin to find that one out. Erithacus rubecula melophilus...was classed as a thrush...now a flycatcher. Disney drew that didn't he. beautiful bird Di, must be great to have such vivid birdlife. I'm not surprised the wonderful male Bluebird picture has so many members liking it. This one would easily win a photo competition. Thanks everyone ! This tree is right outisde of my computer window and I have bird feeders hanging on the house too, so I get lots of "birds-eye views" at birds. your very lucky and a good photographer. Thank you Zandra. I know I'm extremely lucky.